At The Grout Medic of Columbia, SC, we bring grout and tile back to life with our green vapor grout and tile cleaning system and the expertise of our tile repair and grout cleaning crews. The Grout Medic is the leader in the fields of grout and tile cleaning, grout color sealing, tile cleaning, tile repair and tile regrouting. The products and equipment we use represent the latest technology for cleaning grout and tile. From all types of floors to tubs, sinks, backsplashes and shower walls, The Grout Medic’s specialized services will clean, restore and beautify your home or business. Our highly trained teams are committed to providing homeowners and property managers in the Columbia area with high quality grout services. In addition to our grout cleaning and tile repair, we also offer water damage repair and recaulking services. To receive a FREE grout and tile cleaning estimate, contact us today at 866-994-7688! Grout and tile cleaning services are proudly offered through The Grout Medic. 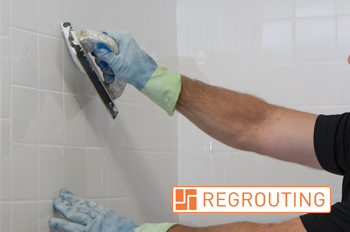 As a porous product, grout will absorb dirt, mildew, mold, and lime scale over time. By using proprietary products and environmentally friendly vapor technology, The Grout Medic will deep-clean grout for a fresh and renewed appearance. As a thick colored substance used to hold tiles together and filling the gaps in between them, grout helps brighten an entire room and prevent substances from going under the tiles. When grout becomes dirty, it can make the tile look old and dingy and the whole floor can get mildew, mold, and lime scale underneath it. This would cause a huge repair in the flooring, costing money and time to fix. All flooring requires some sort of maintenance, and grout is no exception. By using The Grout Medic’s top-of-the-line equipment and service for your grout and tile cleaning services, you can be sure that your grout and tile are clean, protected and easier to maintain. You want your grout and tile to stay clean and tidy without any mold or mildew buildup. With The Grout Medic’s green vapor technology, all of your grout surfaces will be disinfected to eliminate germs and bacteria. Your grout will be free of chemicals and safe for your family for a long period of time. The Grout Medic will ensure that your grout is clean and any dirt, mildew, mold, and lime scale will be gone from the grout. It’s time to get rid of all the dirt and grime that has been embedded in your grout for years! You and your family need grout that looks and feels clean and fresh. Call the The Grout Medic of Columbia, SC today at 866-994-7688 or fill out our quick Customer Info Form to get started right away! Grout sealing companies allow for your grout to gain protection. After your floor has been cleaned and rinsed, a proprietary clear,penetrating seal will be applied to protect your grout. This will help protect your grout from discoloration and staining from daily dirt and grime accumulating in and around the grout. Because grout is porous, it’s important to use grout sealer to fill in the porous areas of the grout. There are many benefits to applying grout sealer besides reducing the porous properties. One is that sealer reduces any staining of the the grout. Sealer reduces the appearance of stains that settle on the grout and on the tile. 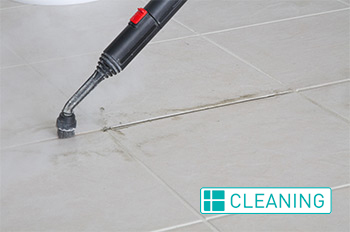 In rooms that experience a lot of steam and humidity, moisture can get into the grout and destroy the tiles. Sealing also makes it more difficult for moisture to build up in and around the surface. Grout sealing companies should add a sealer to prevent this from happening. The overall cost is going to be more efficient with a sealer over the grout. Grout tends to wear away more quickly when it is not sealed, so it will crack and become hard to manage. This will force you to replace it more often than if it was sealed, leading to higher costs overall. 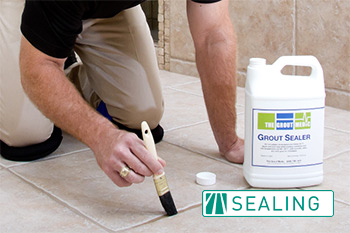 By adding a sealer, grout sealing companies are ensuring the grout will benefit your floor for a longer period of time. Sealing is the only way to protect the grout in your home, so have your grout sealed right away to keep out dirt, grime and mildew. Don’t wait while your grout gets dirtier. Get grout sealing services from The Grout Medic of Columbia, SC. Call us at 866-994-7688 or fill out our quick Customer Info Form today! Grout sealing companies allow for your grout to gain protection. After your floor has been cleaned and rinsed, a proprietary, clear and penetrating seal will be applied to protect your grout. This will help from any discoloration, staining, and daily dirt and grime from accumulating in and around the grout. Grout sealer is important because it is porous and in order to reduce the amount of porous areas of the grout, a sealer must be applied. There are many benefits to applying grout sealer besides reducing the amount of porous properties. One is that it is going to reduce any staining. Sealer is going to reduce the appearance of any stains that could accumulate on the grout and on the tile. Moisture is going to become more difficult to build up in and around the surface with sealing as well. In rooms that have a lot of steam and humidity, a lot of moisture can get into the grout and destroy the tiles. Grout sealing companies should add a sealer to prevent this from happening. Colored grout sealing is what you need to make your grout look more attractive and keep it protected. The Grout Medic of Columbia, SC can clean and seal your grout right away, if you call us at 866-994-7688 or fill out our quick Customer Info Form! Instead of wasting time and money trying to re-tile the entire surface, regrouting services dramatically improve the appearance as if you had replaced the tile. By using professional tools, a technician will remove the grout from around the tiles and then will place new grout in between the tiles. You can regrout your shower, bathroom, kitchen counters, floors, balconies, and fireplaces or anywhere else that has tile within your home. The longer you wait to have your cracked or damaged grout fixed, you increase the chances for mold and mildew to develop under your tiles. Don’t let that happen! Call The Grout Medic of Columbia, SC today at 866-994-7688 or fill out our quick Customer Info Form to get help right away! Caulking contractors at The Grout Medic offer specialized services to improve your residence. Caulk provides a watertight seal between countertops, tubs, and shower seams. However, it can deteriorate over time, causing you to need to apply new caulk. There are many benefits to recaulking an area in your home. Our caulking contractors will provide you with a clean, fresh seal. This is going to help protect against any mold and fungus growth in the future. Mold can be dangerous to your health, so it is important to ensure that all areas are free from mold. Old caulk can cause mold and dirt to accumulate and can cause issues that will be costly and harmful. Recaulking services give you a fresh and new look to the property. Instead of having an area that looks dirty and old, you can simply recaulk the area to provide a fresh new feel. Your home will be more welcoming and enjoyable after you have recaulked the necessary areas. Those surfaces that you recaulk are going to have a prolonged life because of the addition to caulking. When caulk gets old and breaks down, you risk getting mold and this is going to cause you to fix the issue quicker than if you would have recaulked before it got old and broke down. Having a new application of caulk provides a clean, fresh seal that not only looks great but helps protect against mold and fungus growth in the future. The Grout Medic can help you with any recaulking services that your home needs in order to keep it looking clean, fresh and elegant. Keep the caulk in various areas around your home in pristine condition by recaulking it and benefitting from its use. Recaulking not only protects your tile and fixtures, it will improve the dirty look of your home. Recaulking is simple and quick with The Grout Medic of Columbia, SC. Loose and hollow tile in your kitchen, bath or other tiled areas doesn’t mean complete tile replacement. The Grout Medic can secure loose tiles all at a fraction of the cost of replacement. 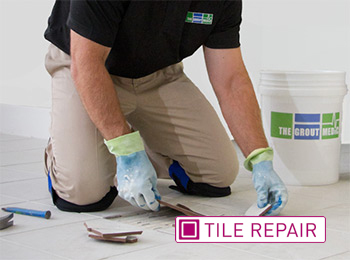 Tile repair allows you to keep the tile you love while making it structurally sound and protecting against costly future repairs or replacement. You deserve to have beautiful tile within your home, and there’s no reason to wait! The Grout Medic of Columbia, SC can repair your tiles quickly and affordably. Get a free quote on tile replacement services from The Grout Medic of Columbia, SC by calling us at 866-994-7688 or filling out our quick Customer Info Form! Proper water damage repair can help to prevent further costly and unneeded repairs or remodeling. By removing and replacing water-damaged areas and cleaning with the highest quality products, you and your family will be safe from the many health risks associated with mold and mildew. In addition to those benefits, your repaired areas will be as good as new for many years to come. If you do not fix water damage and leave it unattended, your home may start to grow mold, mildew and even have permanent structural damage because of the damaged tiled surfaces. Water damage contractors can inspect the damage and perform proper cleanup and repair. Before the need for expensive repairs, The Grout Medic can remove and replace only the affected areas, giving your showers, sinks, and kitchen areas a brand new look while protecting your home from long-term water damage. You will be preventing mold and mildew by having a professional that is going to clean up any excess water before the mold and mildew have a chance to form. Industrial-grade disinfectants and cleaners are used so that you and your family will be safe from the many health risks associated with mold and mildew. Water damage cannot wait! For the protection of your family and your home, have water damaged repaired immediately by The Grout Medic of Columbia, SC. The Grout Medic Columbia is owned and operated by James and Lindsey Wiard. My first experience with The Grout Medic (James) was very rewarding. James arrived precisely on time, reviewed our agreement / contract and started the task. His workmanship was exquisite and precise, which he accomplished while being super neat. He respected our home while doing his work and was extremely professional and polite. The Grout Medic did an excellent job on two of our bathroom floors. They look brand new! I highly recommend Grout Medic. James did an excellent job cleaning, caulking, grouting and sealing the tile in my Bathroom. It looks like a new bathroom. James was very professional, friendly, on-time and did everything he said he would do. He is very knowledgeable in his field and does a great job. He also explained everything and left written instructions.